First visited by Christopher Columbus in 1503, his reports tell of incredible numbers of fish, turtles and crocodiles hence their original name of Caimen or The Cayman Islands. 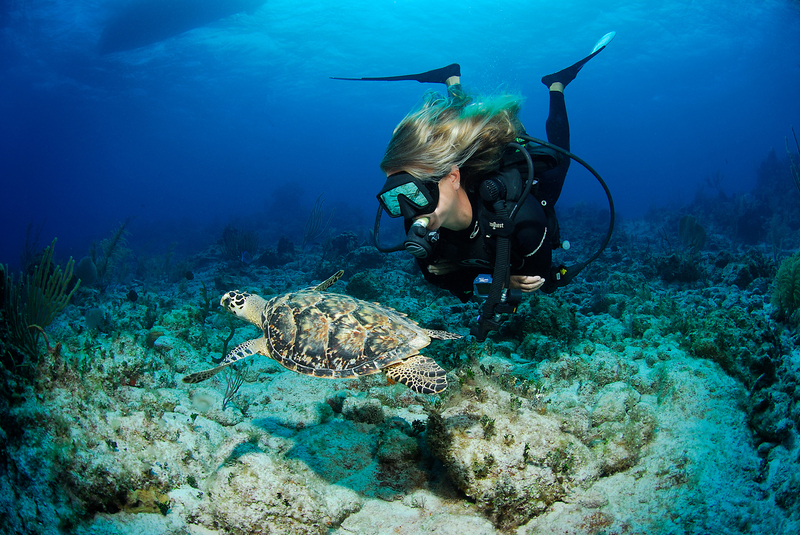 Whether entering these waters as a novice or as a more experienced diver, what is obvious is that Cayman waters have some of the clearest waters in the Caribbean, with very few currents they are the ideal destination for virtually guaranteed results. The group of islands sit atop three huge submarine mountains and have incredibly deep water all around, resulting in any sedimentation or particulate in the water to sink into the depths, keeping the coastal waters nice and clear all year round. Cayman Brac, Grand Cayman’s farthest sister island is known affectionately as “the island that time forgot” and at only 20 km long (12 miles) by just over 1.6 km wide (1 mile) and with a resident population of only around 1500 people you can easily see why. There are only two hotels on the island: The Brac Reef Beach Resort and the Alexander. The Brac Reef is home to the famous Reef Divers dive business, but there is a new dive centre, The Brac Scuba Shack run by the very experienced Martin & Liesel van der Touw that is now catering to the larger number of shore divers who are coming to stay on the island. Offering private boat charter and twin tank boat dives, they are perfectly suited for hiring and collecting your dive tanks for all the shore dives available, if you want to cater for yourself without the limits of time. The Brac is roughly split into two, with the flat area to the west of the island where the airport and dive shops are located and the steep bluff with its remarkable ancient coral limestone cliff and caves at North East Point which rises to 42 metres (140 feet). The word “Brac” is Gaelic for “Bluff”. The locals are known as Brackers and the island is the smallest in the Caribbean to host a full jet service. With direct jet flights from Miami into the Charles Kirkconnel International Airport and a large number of small B&B and rental apartments as well as the two resort hotels, Cayman Brac has rapidly earned its reputation as the top shore diving island in the entire Caribbean. (Bonaire used to hold this accolade, but a number of the sites are often off limits and several are quite difficult to undertake). The beauty of Cayman Brac is that virtually the entire north shore has small ‘barcaderes’—or boat slips dating back several hundred years, where the famous Cat Boats were built and launched. These small slipways are perfect for easy access onto the shallow fringing and barrier reefs, plus, of course, the larger concrete slipways and stepped entries for more modern craft. Toilets and picnic tables can be found at a number of the shore sites, making things that bit more comfortable and with an almost total lack of diver pollution, the shore diving to be found off Cayman Brac is second to none. Weather dependent, the south shore also has a number of boat ramps and slipways as well as direct access to all of the inshore reefs and the main sheltered lagoon at the west end.